Gravel-free, 100% permeable parking, walkways, sidewalks and handicapped designated spaces that are user friendly for any size wheel, caster or high heel! And strong – park your RV on your DECK patio if you want- it can handle the weight! Put a DECK sport court in your parking lot. The DECK drains instantly and comes preassembled to the PRO PLUS for commercial strength. Accent your TRUEGRID PRO PLUS lot with bright blue or charcoal gray DECK. 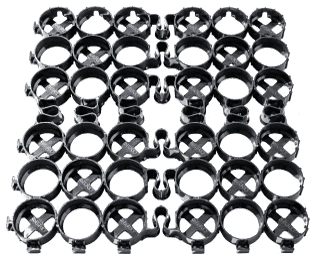 The TRUEGRID® DECK™ connects to the TRUEGRID® PRO PLUS™ paver to create unique pavement designs. Instantly draining with storm water detention below, the DECK offers puddle free walkways, handicap parking and patio areas. No gravel, textured grip surface. Double beam construction assembled with PRO PLUS base for strength. Wheel & heel friendly! Design, create and enjoy. Highly visible and attractive. Designated parking areas. From shopping cart wheels to push cart casters to wheelchairs, permeability and mobility are easier than ever. Line up the locking tabs and step on to connect. It’s that easy. No gravel fill needed. 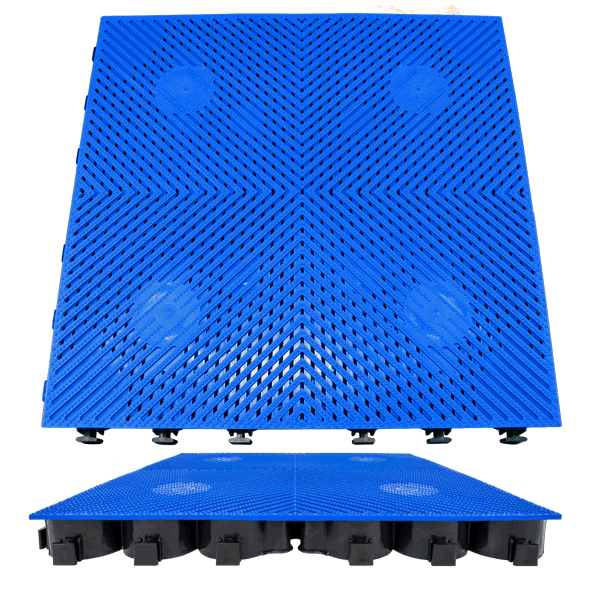 Pre-assembled to PRO PLUS grid base and can connect to adjoining PRO PLUS grass or gravel filled surface. Can be saw cut as needed. Use standard striping paint to stripe or mark as desired. Now your walkways and sidewalks can drain! No more puddles or pooling water. TRUEGRID® products are 100 % permeable so rainwater drains instantly through the surface instead of running off or pooling. TRUEGRID® DECK™ is an element of the TRUEGRID® PRO PLUS™ system. DECK has a PRO PLUS base and can connect to the PRO PLUS for complimentary design. The highly visible, pleasing aesthetic draws attention to designated parking areas, walkways and patio areas. Great visual and functional compliment to gravel or grass filled attached parking lots. TRUEGRID can be built in many ways. Find what works best for you by discovering what other TRUEGRID customers successfully installed. Add wheelchair and cart friendly, permeable DECK to your site. Use standard striping paint to stripe or mark as desired. Preassembled to PRO PLUS base and connects to PRO PLUS. Easy to install, gravel-free DECK®. From shopping cart wheels to pushcart casters to wheelchairs, DECK takes permeable paving to the next level. Installing TRUEGRID is as easy as building blocks. There are just a few steps to take before laying down the grid. Explore our guides for different projects so you can start install today!